She has in depth experience of working with UAE nationals, other Arab expatriates & various other nationalities. 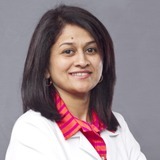 She is the Head of Department NMC Bloom (Obstetrics and Gynaecology) at NMC Specialty Hospital, Dubai since 2009. She is responsible for starting the Mama Care Program (Maternal Education for expecting women and post-natal care) for expecting mothers in our hospital. She has attended various international conference & workshops. She has handled complicated cases in Obstetrics and has managed many preterm deliveries, high risk, complicated pregnancies and pregnancies with previous 3 or more cesareans. She also performs routine gynecological surgeries like vaginal & abdominal hysterectomies, Tubal and ovarian procedures. She has undergone training in operative Hysteroscopy & Laparoscopy form the Centre of Excellence for Minimal Access Surgery Training in India. She is also skilled in Colposcopy. She is fluent in English, Hindi, Urdu, Arabic, Tamil, Telgu, Malyalam, Marathi & Tulu.